Over the decades, HVAC technology has rarely made it easy for people to save money without compromising comfort. That's all changing, with the advent of new concepts and improved technologies that, especially when combined, truly serve the interests of the average homeowner. When you stop and think about it, doesn’t it seem strange that, in the typical residence, a single thermostat controls the temperature of the entire house? After all, no matter the size of your family, its members cannot possibly occupy every room at every moment of the day. And yet, in order for the upstairs bedrooms to feel comfortable on a winter night, you must heat not only the bedrooms, but every other room too. Flash-forward to noon the following day: Though no one has visited the second floor for hours, the heating system has kept the vacant spaces at 70 degrees. It’s a waste of energy and, for the budget-minded homeowner, the stuff of nightmares. Plus, it’s impractical, as it ignores the simple fact that different people prefer different temperatures. If your spouse likes it warmer, and you like it cooler, then, in a one-zone system, no matter the set temperature, there’s always going to be someone who feels not quite at ease. For whatever reason, Americans take it for granted that home heating has to be an expensive hit-and-miss affair—better than no heating at all, to be sure, but miles from perfectly comfortable. What many don’t realize is that, just as other technologies have seen incredible progress in recent years, so too has the heating world. Take radiant heating, for example. Though it’s been around for millennia, it hadn’t always been a technology that could rival forced-air as a viable whole-home heating option. But now, thanks to contemporary manufacturers like Warmboard, many would argue that radiant heat actually surpasses conventional forced-air heating for a host of reasons. Chief among them: Radiant floor heating lends itself much better to zoning. A multi-zone radiant system provides the alternative to heating an entire home to one temperature. Here, it’s possible to designate zones (individual rooms or sets of rooms), each capable of being independently controlled. If traditional heating provides a one-size-fits-all solution, then zoning offers a tailored fit. Zoning gives the homeowner an unprecedented level of control, making it possible to save money and be more comfortable than ever. Just imagine owning a home whose sunny, south-facing portion always felt a few degrees too warm. Without zoning, there would be no way to dial back the heat here without making the other parts of the house too cool. Only with zoning is there a rational solution for such a seemingly simple problem: Lower the temperature setting for the sunny-side zone but maintain a higher temperature elsewhere. By allowing heating on an as-needed basis, zoning saves the average household up to 30% on monthly utility bills, according to the U.S. Department of Energy. But it’s not solely about savings. Zoning also gives a tremendous boost to comfort: Finally, family members with different temperature preferences can be comfortable under the same roof. Not so long ago, manual, non-programmable thermostats were the norm. Whether yours was a mercury or mechanical-contact model, you had three options: You could turn the thermostat up, down, or off. Identifying and acting upon money-saving opportunities required diligence, and many people simply didn’t have the patience. Now, thanks to programmable thermostats, you don’t have to remember to adjust the temperature setting on your way out the door. The thermostat remembers for you. In the context of zoned heating, programmable thermostats mean that you can set a different schedule for each different zone. Then, if you want, you can forget about climate control altogether, trusting that each zone would operate strictly according to the program you set for it. Indeed, programmable thermostats eliminate the potential hassle of coordinating different zones, while making it easy to capitalize on the savings that zoned HVAC makes possible. Technically, you can establish zoning with any type of heating system, even forced-air. But would you want to? Opting for conventional forced-air heating could undermine whatever savings or comfort you were able to achieve through zoning. After all, forced-air systems are notoriously inefficient, largely on account of their leak-prone ducts. Particularly when traveling through un-insulated spaces, traditional ductwork can lose enough energy to hinder overall efficiency by around 25%. That’s one reason why forced-air heating tends to cost a small fortune every month. At a fundamental level, there are weaknesses in the system design. What’s more: Forced-air heating has never been especially comfortable, because it creates uneven temperatures. As hot air rises in a typical two story home, the upstairs becomes too hot while the downstairs remains cool. Often, one’s comfort depends on his location relative to the nearest vent. Plus, because of the cyclical, stop-and-start operation of forced-air systems, temperatures end up fluctuating along an up-and-down, rollercoaster-like pattern. And if someone leaves a window open, all that heat being generated is wasted. Unlike forced-air, radiant heating does not work counter to the benefits of zoning. On the contrary, the two work technologies work in concert to bring superior comfort, even while minimizing monthly energy bills. Because radiant heating panels install beneath flooring, warmth is delivered, not through a finite number of vents, but across virtually every square inch of space. So as you move to different parts of a room, or from one room to the next, the temperature never varies. Comfort reaches you silently, invisibly, and in a steady, even, enveloping way. Though radiant systems offer significant performance advantages, be aware that not all radiant systems are alike. Different radiant systems include different components, and those components can make a big difference. 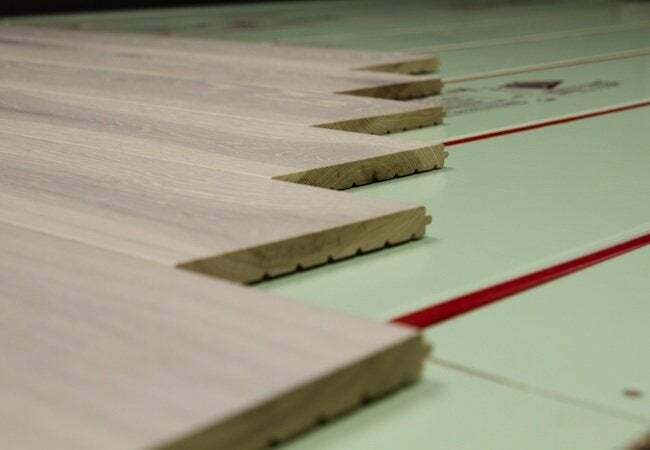 Focus on systems like Warmboard, which boast a high conductivity. Greater conductivity means less energy consumption, lower energy costs, and a quicker rate of responsiveness. Fewer than ten percent of homes in the United States today are heated by a radiant system, but that’s changing. More and more homeowners are choosing radiant heating, not least because of its favorable relationship with zoning. For homeowners seeking efficiency and comfort—who isn’t?—zoning has meant a great step forward in home comfort. Together, radiant heating systems and zoning capabilities bring out the best in one another, and for once, it’s the homeowner who really benefits.